Razor Sharp: The KTM 790 DUKE is devastatingly accurate. The agility you'd expect from a single, blended with the meaty punch of a twin. It carves corners with pinpoint precision, boasting the all-new 799 cc LC8c parallel twin motor nestled into one of the lightest and most compact chassis around. The KTM 790 DUKE is all about being fast where it counts - in the corners. Dynamically flicking from one bend to the next, putting you in the heart of the action and not on the sidelines. Class Of Its Own: Built for torque, this liquid cooled 8 valve, DOHC unit delivers 87 Nm at 8000 rpm, almost immediately followed by a roaring 105 hp finale. Meanwhile, an advanced ride-by-wire system guarantees great refinement as well as low fuel consumption and emission figures. The 8 valve DOHC cylinder head contains twin chain-driven camshafts and one sparkplug per cylinder. Additionally, the camshafts in the790 DUKE are assembled, which makes them even lighter than forged camshafts. DLC coated finger followers, steel valves and a hydraulic chain tensioner complete the cylinder head assembly. No one enjoys unpleasant vibes. That is why the KTM 790 DUKE employs the use of balancer shafts placed in front of the crankshaft and in the cylinder head to ensure the smoothest power delivery and minimal vibration. Coated aluminum cylinders are an integral part of the sleeveless engine casing design of this 799 cc parallel twin. This open deck cylinder construction allows for optimal cooling, improved production tolerances and reliability. The Perfect Noise: A stainless-steel thing of beauty. The middle damper centralizes mass and allows for a relatively small muffler that plays a dramatic soundtrack. Hundreds of test bench runs and complex simulations ensured that this exhaust system contributes decisively to the tractable torque curve and excellent emission standards. Deep Breath: The airbox sits snugly inside the subframe, with the air intake on the sides, allowing the bike to keep things cool while you gun it. A large dose of the KTM 790 DUKE's agility comes from the deftness of its lightweight chassis. 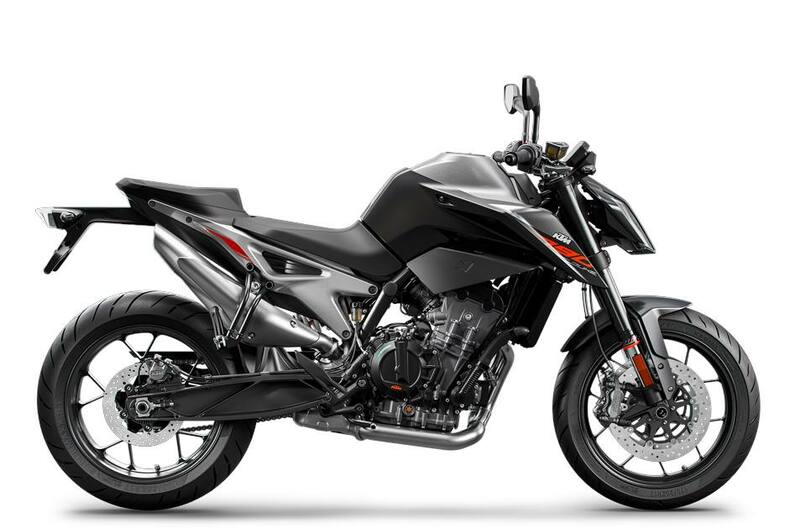 While it uses its compact parallel twin engine as a structural and dynamic pivot point for quick responsiveness - it is the tubular steel frame, innovative cast aluminum subframe and swing arm that conspire with performance-oriented wheels, brakes and WP suspension to unleash a ride unlike any DUKE before it. 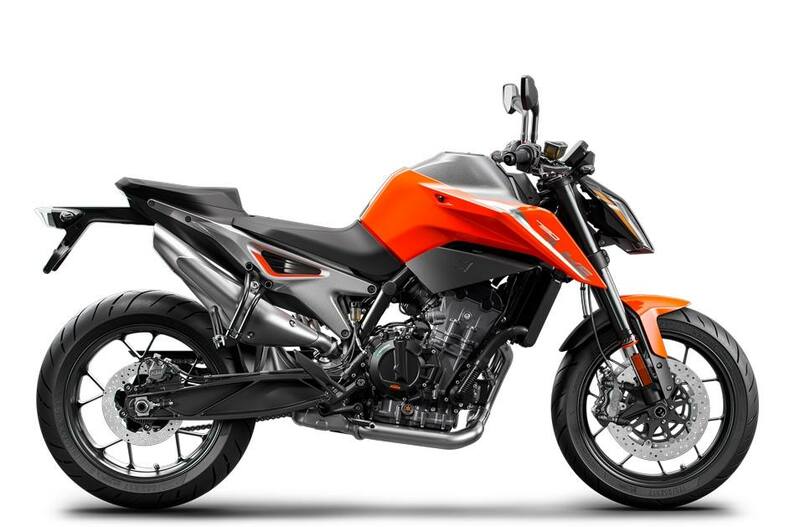 Core Strength: The incredible handling characteristics of the KTM 790 DUKE are founded on the dynamic, loadbearing design of the tubular chassis. Engineers had one goal in mind, and that was to keep the chassis as rigid and compact as possible for sharper turn-in and greater lean angles, allowing it to slice through the turns with extreme responsiveness. The subframe is cast aluminum and houses the airbox. No plastic covers, no additional brackets - everything is cast into two connected pieces to reduce complexity and weight. The triangular shapes in the subframe were inspired by KTM's trellis subframes, as this allows for a strong and simple construction. Power, Meet Tarmac: The KTM 790 DUKE is fitted with extremely lightweight, light-alloy wheels manufactured in a low-pressure die casting process. Not only do the lightweight wheels make the bike lighter overall, they also minimize the unsprung masses and moment of inertia, with a positive impact on the handling and ride dynamics. The MAXXIS Supermaxx ST tires fitted to the KTM 790 DUKE have been developed specifically for this bike. Thanks to a special compound, the tires are grippy in both wet and dry conditions and strike a balance between sportiness and everyday rideability, offering the rider a stable ride and excellent tire wear. The 43 mm open cartridge upside-down fork from WP Suspension provides you with a set-up that's unseen in this segment. The fork uses split function technology, which means compression and rebound damping take place in separate fork legs, allowing for better tuning of the fork behavior. The fork springs are progressive, ensuring a smooth operation throughout the fork stroke; soft for the initial stroke and harder further down the stroke to prevent bottoming out. Keeping the rear end on check is a state-of-the-art, gas assisted WP shock with progressive spring and preload adjustment. This ensures maximum traction while attacking a twisty ribbon of tarmac. This reliable and sensitive WP steering damper has been setup to give the rider ultimate feedback through the bars, while keeping the front wheel uncompromised over uneven tarmac. You won't even know it's there, until that one nasty bit of road comes up mid corner. 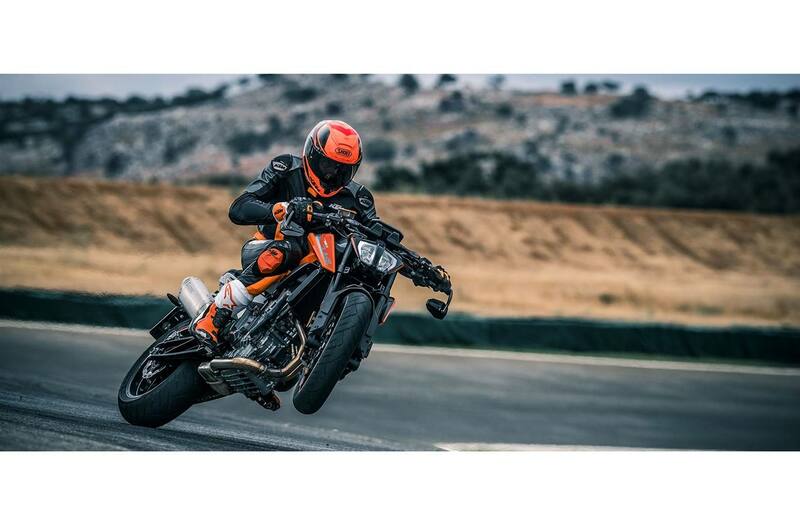 Pulling Out All The Stops: Maximum deceleration is ensured at the front wheel on the KTM 790 DUKE by the two radially mounted four-piston fixed calipers and two 300 mm discs. The spacing between hand brake lever and handlebar is adjustable so that the lever is within easy reach for every rider. The front brake receives effective support from the disc brake on the rear wheel, which features a single disc and a single piston floating caliper. All this stopping power is supported by KTM's Cornering ABS. Designed to deliver confidence-inspiring control for a wide range of potential riders, the KTM 790 DUKE's sleek body offers the ease-of-movement needed to effortlessly direct The Scalpel's dynamic movements out on the ride, while still allowing fine adjustability for comfort - whatever your skill level. Take The Reins: A tapered aluminum, 760 mm wide handlebar puts you in full control. It's adjustable, with 4 positions on the triple clamp and can be rotated in three further positions for that perfect riding position. The hunkered-down aggressive stance of the KTM 790 DUKE is intimidating to all who cross its path. It clearly takes some of its design cues from the KTM 1290 SUPER DUKE R - most obvious being the unique headlight ‘face-mask'. Its distinctive sharp lines and compact 11/13 proportions are set off by signature KTM graphics, which leave no doubt as to its road-dominating intentions. Information Station: A multicolor combination of relevant information, presented in an uncluttered way. As you rev the engine, the display bars change color, either spurring you on or warning you that the engine's still cold. The display also automatically adapts its illumination to the ambient light and gets racy when TRACK mode is selected. Form and function are seamlessly integrated in the KTM 790 DUKE. Take the LED headlight for example, a highlight in this bike's design. It combines optimal illumination of the near field with maximum light output. And the daytime running lights on both sides ensure that the motorcycle is perceived better and is more differentiated by other traffic users, thus offering massive safety benefits. The LED taillight is mounted on the license plate holder to make it easy to remove for trackday use or customization. The KTM 790 DUKE might carry some muscle and grit, but it also comes with some serious brainpower as standard. Delivery of the 78 kW (105 hp) and 87 Nm is efficiently controlled by advanced electronics and next-generation rider aids. Even when you're flirting with the limit, KTM's combination of the most advanced software and electronics in the world of motorcycling allow you to easily select the level and degree of assistance needed to maximize your thrill factor out on any ride. All you have to do is focus on the road ahead - and hold on tight. Track mode, as the name suggests, offers unlimited thrills and READY TO RACE characteristics. It features a launch control function for quick getaways, variable slip adjustment, increased throttle response and the ability to pull epic wheelies by disengaging Anti-Wheelie. Motorcycle Traction Control (MTC) is a mouthful, but it's an important part of the KTM 790 DUKE. MTC is a lean-angle sensitive traction control system, which reduces engine output with an extremely smooth, barely perceptible. Depending on the selected ride mode, MTC also allows for several levels of traction slip at the rear wheel. But that's not the end of it - Daredevils, we give you: the off-switch! The KTM 790 DUKE allows for slick, clutchless up and downshifts thanks to KTM's own Quickshifter+ system. It reads and responds to your riding under any load to ensure shift action is as fast as you are. When downshifting, the system matches the engine speed to the speed of the lower gear. You'll find a full range of KTM PowerParts and luggage options available for the KTM 790 DUKE. Make aesthetic changes to intensify your ride, to reflect your personal attitude, fine-tune the function and adjust the performance to perfectly match your individual riding style. Wherever you ride and however you like to attack the turns, KTM PowerParts have you covered!